Apart from a very short and easily portaged gorge halfway down, the South Temple below the hut provides fast and consistent paddling through boulder gardens. This sweet section of stream needs a bit of rain to bring it into condition for paddling, otherwise it is just too bony to float. There are a few options for this trip. 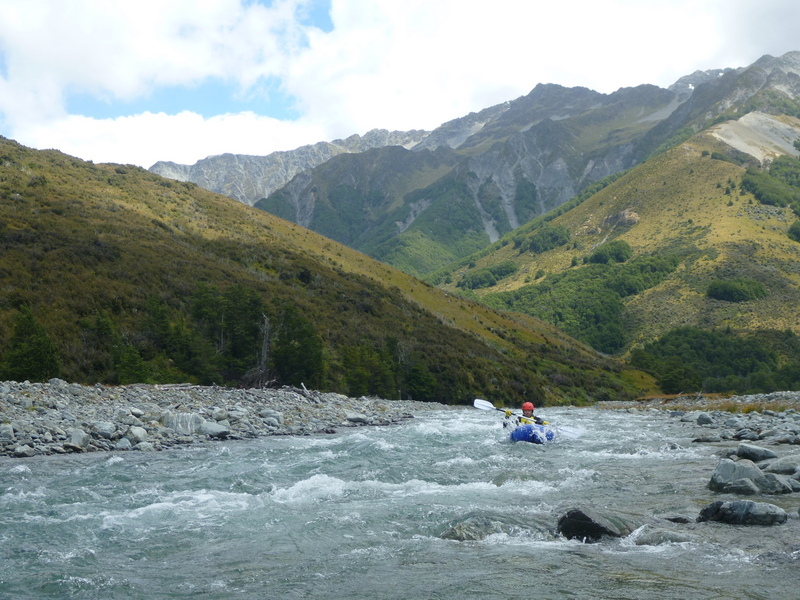 Firstly, you could finish the North Temple to South Temple circuit with a paddle out. This would be tricky to manage weather wise, as you’d need reasonable weather to get over Gunsight Pass safely, but then rain overnight to bring the stream into condition. 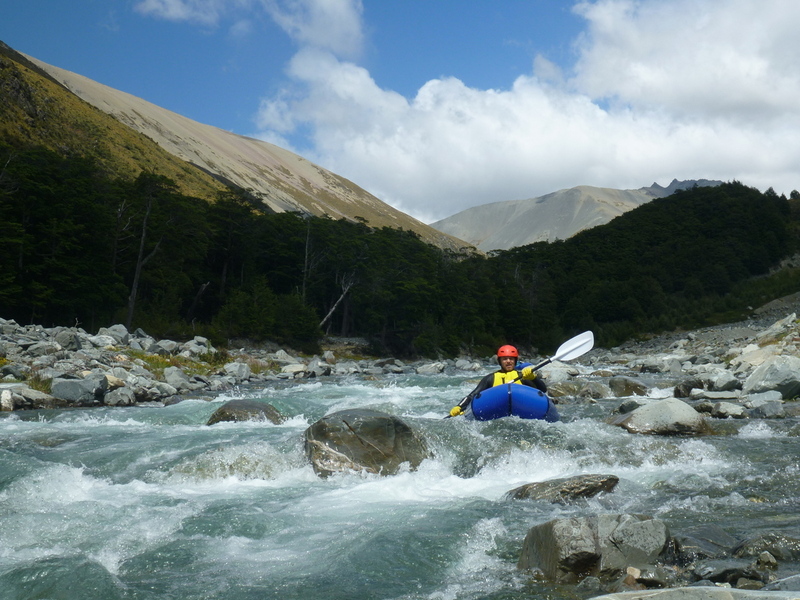 A more reliable option would be to hike into South Temple hut in the rain, then chill out at the hut in the morning until the river drops to a good level. 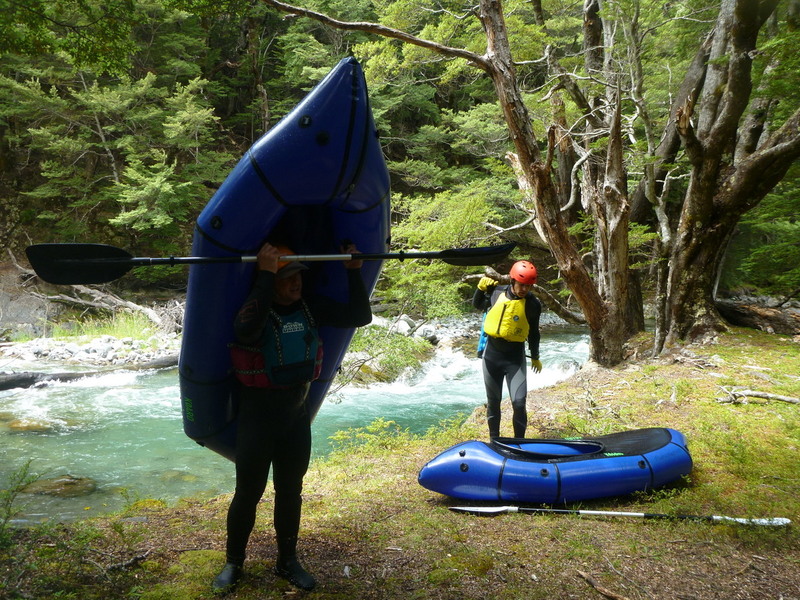 You’d need to be a bit careful with the forecast, as too much rain would put it out of safe paddling flows for the majority of packrafters. Alternatively, its close enough to the road end to be done as a day trip. Its worth assessing the flows as you drive over the main Temple Stream bridge. If it looks like it could be a bit bony and low, chances are it’ll be too low higher up in South Temple. From the Temple Campsite, head up valley, then cross the North Temple Stream. 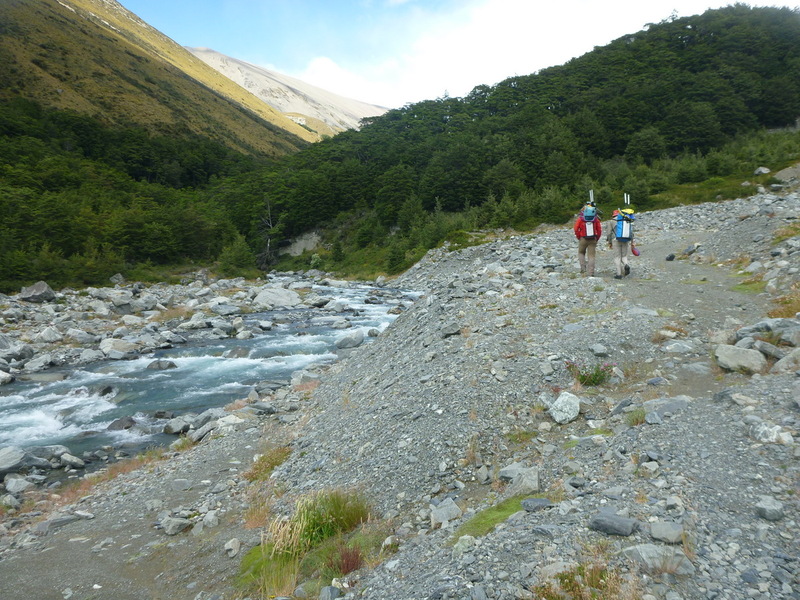 The South Temple Track follows the true left of the river and below the gorge, its easier just to follow the river bank and scout the stream as you go. The track climbs up and over the short gorge, before returning to the streamside. Take note of this take out point for when you portage the gorge. Further up valley the track is often 100m or so meters from the actual stream, so there’s less opportunities to see what you’re in for. The South Temple Hut is a great place to spend the night, though its is on the opposite side of the river to the track, so beware about being stuck here if it rains too much!. The Temple Valley Tracks page on the DOC website has a little more info on the track. DOC suggest 3-4 hrs to reach the hut, though we’d suggest more like 2 for a fit and appropriately experienced party. So far, this section has only been packrafted from about 1km above the middle gorge. 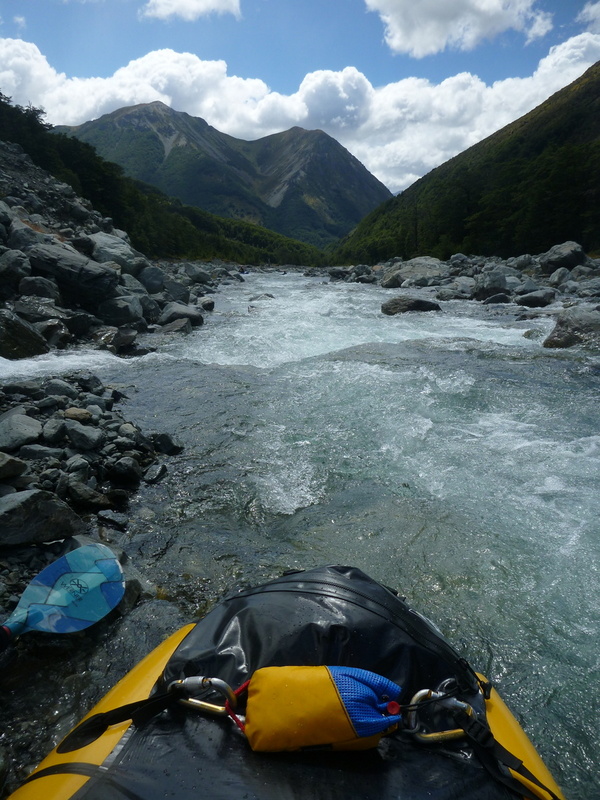 Reports from trampers and the look on the map suggest that putting on directly below the hut should work fine at the right waterlevel, since its just below the confluence of several tributaries. When the flow is just a little above normal, this section is a fast and shallow boulder garden. 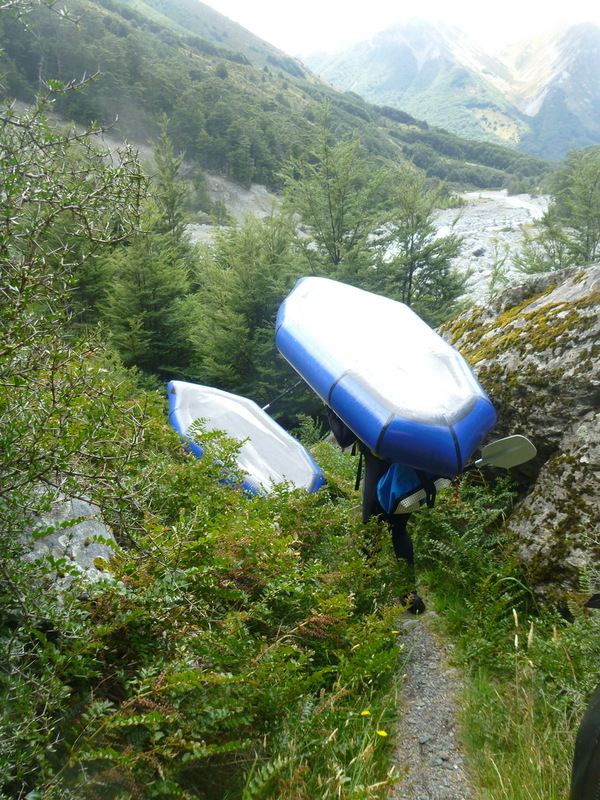 Lots of quick manoevering is required to navigate between the boulders. The boulder garden is very continuous, there aren’t distinct pools or big eddies, just a few very small eddies behind the bigger boulders and occasionally by the banks. There are also a reasonable number of log strainers at inconvenient places like blind corners and so on. With the wood and lack of big eddies, you have to be quite careful with scouting conservatively, and always having an eddy in sight. With more flow it’d likely be solid class III paddling. The valley steepens on the river left side signalling that the gorge is about to commence. The take out above the gorge isn’t completely obvious from the river, so having seen it from the track on the way in helps. 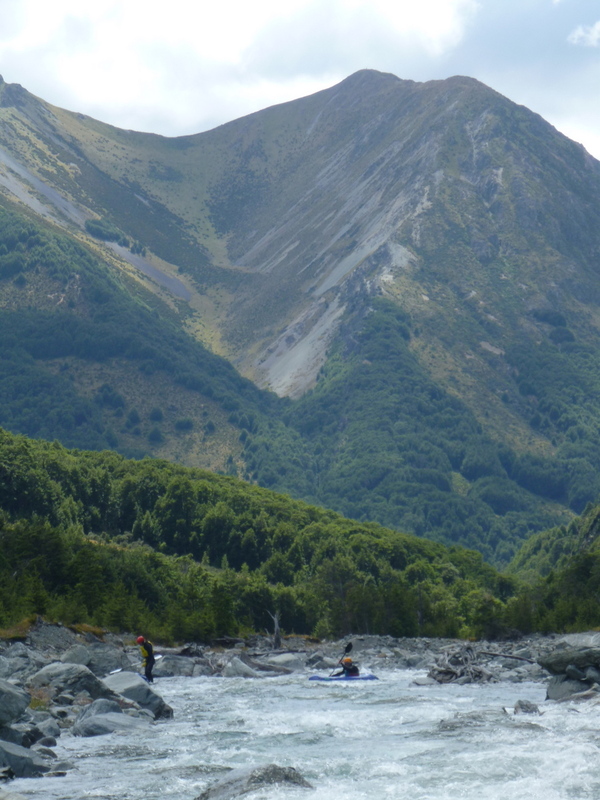 It’s a quick and easy portage via a good track to the next section below the gorge. 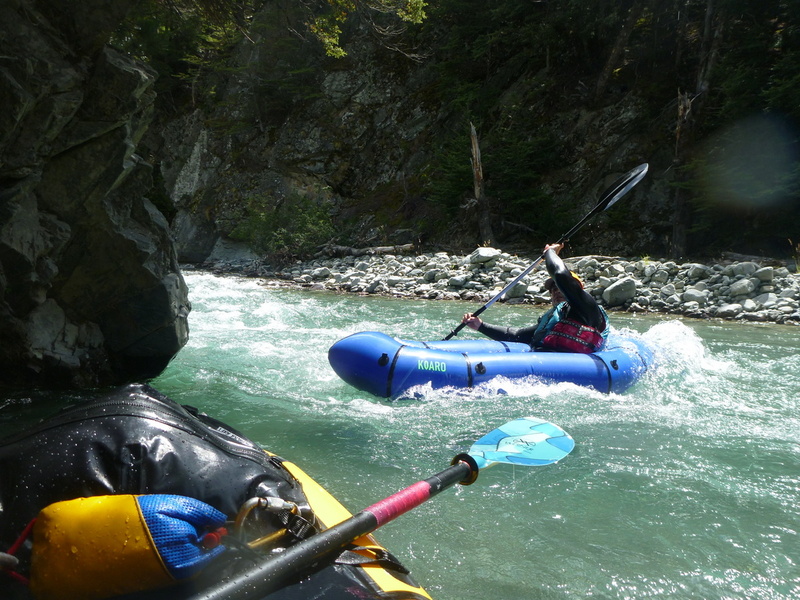 We didn’t paddle this section, but on the true left track, you can peer into the gorge (and escape it if needed). It appeared to be about class IV, with tight lines and several 1m drops. Probably about 200m long. The stream continues with the same character as above the gorge, before eventually mellowing into straightforward wave trains just before the confluence. From the confluence, its class II wave trains through until the gorge begins. 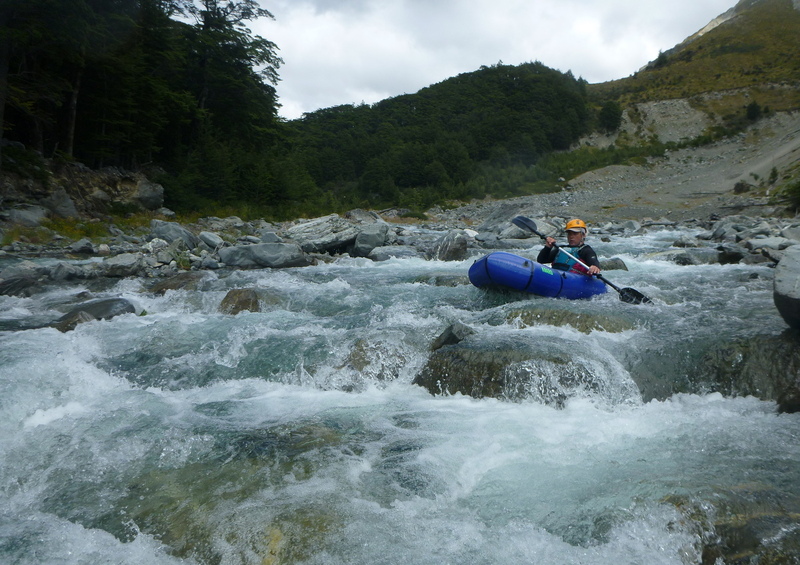 The gorge is also class II, with more distinct rapids and pools. The gorge walls are intermittent, so it would be straightforward to escape it if nessecary, but its so short that it’d be unlikely you’d need to. Take out at the road bridge, then go walk back to your car. Check out the flow at the Hopkins Valley road bridge. 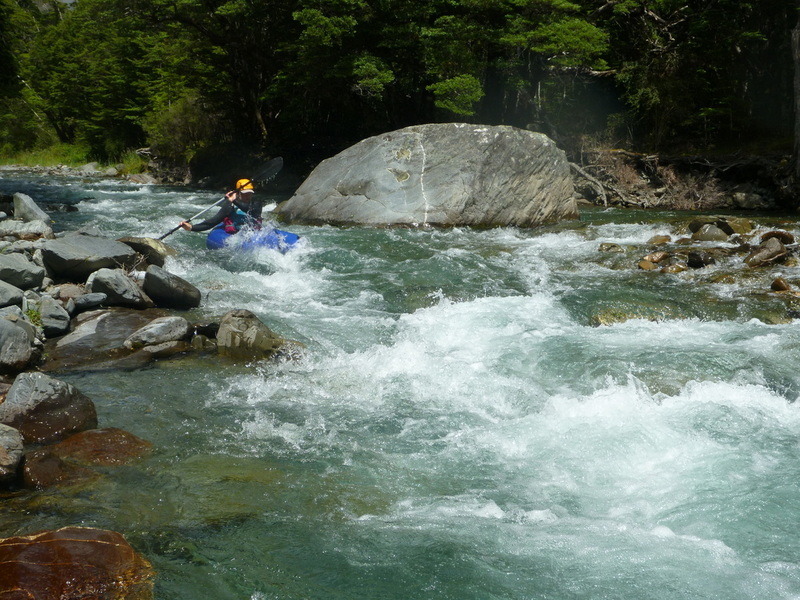 Looking for a flow where there’s just enough water to float over most of the rocks in the middle of the rapids. Any less and it’ll be too bony. Anymore and its up to you to decide! Ahuriri at SH8. 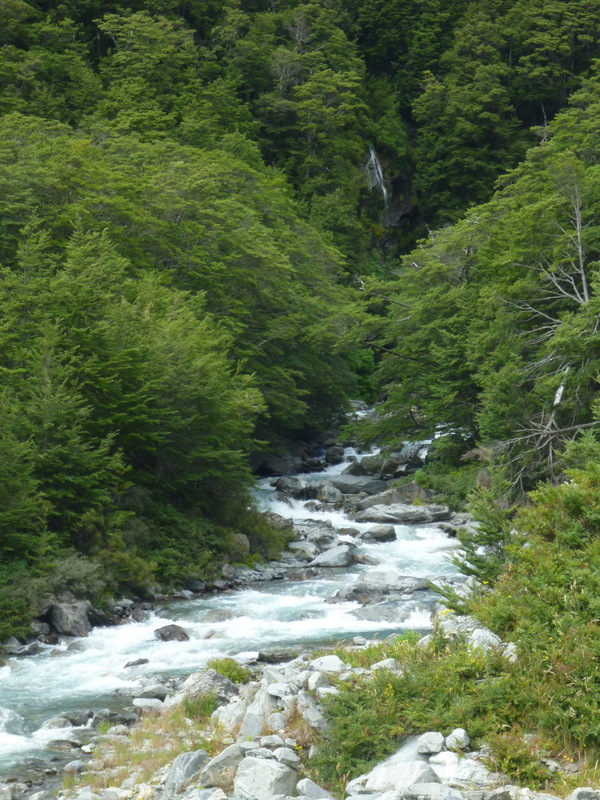 The Headwaters of the Ahuriri are close to the Temple, so it would give you an indication of the levels before deciding to make the trip out to the river.